When NASA’s Stardust capsule flew within 149 miles of the comet Wild 2 in January 2004, its main goal was to collect particle samples from the comet’s coma—the cloud of frozen dust and gases that trails the comet’s nucleus. This week, NASA released its initial findings, which have changed scientists’ perception of how comets form. Comets have long been thought of as frozen chunks of rock and ice that formed in the cold outer reaches of space. But upon analyzing Stardust’s samples, scientists observed that at least 25 percent of the particles retrieved originated from the ultra-hot center of the solar system. 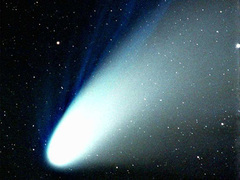 This finding suggests that comets are more diverse than previously thought. It also provides new insight into the importance of the X-wind, the magnetic jetstream most likely responsible for carrying high-temperature particles to the outer solar system, where comets form. It is amazing how many Nasa is developing technology to start understanding how our universe works. I think the ancient civilizations knew more about it than we are in these days.